Against all advice, a beautiful young lady travels to Maiduguri, a chaotic city in the BOKO HARAM ravaged north-eastern Nigeria, in search of her missing businessman father. She soon disappears, the four corpses of her bodyguards turn up in a canal and a mega ransom demand is sent to her billionaire uncle by a faction of the BOKO HARAM terrorist group. 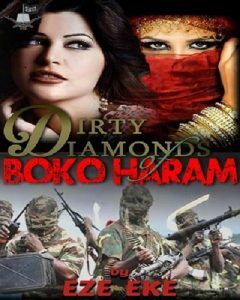 Since neither the Nigerian Army nor the other elements of the JTF had been any help in the search his missing elder brother, the girl’s billionaire uncle quietly puts together a team of mercenary soldiers led by an ex-special forces lieutenant to negotiate with the terrorists and rescue the girl. Everything goes wrong from the beginning because everyone had a hidden agenda. The terrorists looking to keep the ransom and the girl as wife for their commander, laid a deadly ambush for the mercenaries. Three influential billionaires, led by the girl’s treacherous uncles, want her dead in order to get at her father’s vast business empire and fortunes to which she is sole heir. Reaching from the highly populated urban city of Lagos in oil rich southern Nigeria, to the high luxury capital city of Abuja where billionaire business moguls rub shoulders with powerful politicians, top military generals and bureaucrats, some good, some bad, most corrupt, they plot the future of a great nation over a few drinks even as they kill time with high priced prostitutes in overpriced hotel suites and huge luxury mansions. And then on to the war thorn cites and remote countryside of the north-eastern lands where the Islamic terrorist group, BOKO HARAM hold away, wetting the soil daily with the innocent blood of thousands of helpless they kill and many more thousands they render homeless and they battle the combined military forces of four countries. This story unfolds with an explosiveness never seen before. It is the first novel ever written about the activities of the terrorist ravaging the Sahel Savannah region around the famous lake Chad and yet it is much, much more…. A strong desire to tell the truths about human nature as is displayed in numerous area of life. I came up with my characters after reading so many true life tales concerning the issue i wanted to write about. Alex wondered yet again where this man could be getting all this high wired information but he was also intrigued. “Which is why you will be the one handling negotiations with them” said the Alhaji at once. “I haven’t agreed to take the offer yet"
“You and the other men will be issued special military documents that will get you pass all checkpoints without harassment and legalize your presence anywhere in the region” said the Alhaji. Alex was stunned. His brain made the quick conversion. The money was like a quarter of a million dollars! The man in the suit had already gotten to his feet too. He dropped a white calling card on the low furniture table in the center of the room before them. “You have a good night, lieutenant” said the Alhaji curtly and walked off for the door.